This complete vertical of Fontodi’s flagship Flaccianello was fascinating on so many levels. Needless to say, the opportunity to check in on prior vintages and see how they are developing was a big privilege. Even more importantly in this case, though, was following the path proprietor Giovanni Manetti took in his quest to establish Flaccianello as one of the great wines of Tuscany. Flaccianello is 100% Sangiovese from Panzano’s famed Conca d’Oro, an amphitheater of steep hillside vineyards just outside the town center. Along with San Giusto a Rentennano’s Percarlo, Montevertine’s Le Pergole Torte, Isole e Olena’s Cepparello, and a few others, it is one of the great, pure-breed Sangioveses made in Chianti Classico. Interestingly, Flaccianello became a 100% Sangiovese only 1985. Prior to that Manetti used 15% white grapes in his blend, a practice that was obligatory at the time in Chianti Classico. Originally conceived as a single-vineyard wine, in 2001 Flaccianello became a selection of the estate’s best fruit, a decision Manetti made as his vineyard holdings grew to include a number of spectacular parcels in Panzano’s Pecille district. 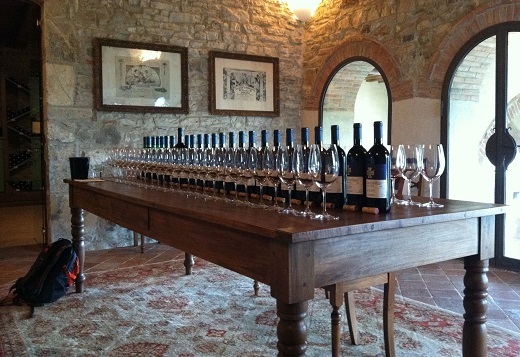 Since then, Flaccianello has routinely been among the most exciting wines in Tuscany. The early vintages up until 1990 spent about one year in French oak barrels, 50% new. In the mid-1990s Manetti increased the period of barrel aging to 18 months with the 1997, and then to 24 months with the 2006. Today the percentage of new barrels is close to 100%. 2. Since 2001 made from the estate’s best fruit across a number of vineyards in Panzano’s historic Conca d’Oro, prior to that a strict single-vineyard wine.